It was 4 in the afternoon, and the two of us sat four barstools apart inside the Golden Spur Saloon. We were the only two people at the only bar in Magdalena, New Mexico. I’d just finished a 10-mile hike, and I was tired. The question hung in the air for a moment — then toppled over into laughter: eager, arrogant, throaty, human. There was something funny about the whole situation — me, a skinny young field intern from Indiana working for a small conservation nonprofit in Socorro called Save Our Bosque Task Force, and this large man of a man, a rancher and offshore-oil drilling consultant who had recently bought a ranch in Magdalena. Here we were, just the two of us and the bartender, sharing a vegetarian pizza, drinking Guinness and whiskey mixes, discussing a special sunflower. The pecos sunflower, Helianthus paradoxus, in New Mexico. My mind flashed images of the previous week. The cool awe of late August desert mornings, red sweep of sun easing awake over Los Pinos Mountains. The bright, stale heat that followed inevitably each afternoon. A momentary, shared stare with a coyote in a field of saltgrass. A muddy sense through it all of the Rio Grande less than a mile to the east, slithering vaguely along, confined to one side of a long ditch and a levee. And the seas of sunflowers, in bright yellow bloom. These great gold swaths of what are known as common sunflowers were not the species that brought dismissive laughter to the Golden Spur Saloon. My fellow intern, Shannon, and I had spent the past week walking in circles around Pecos sunflowers. 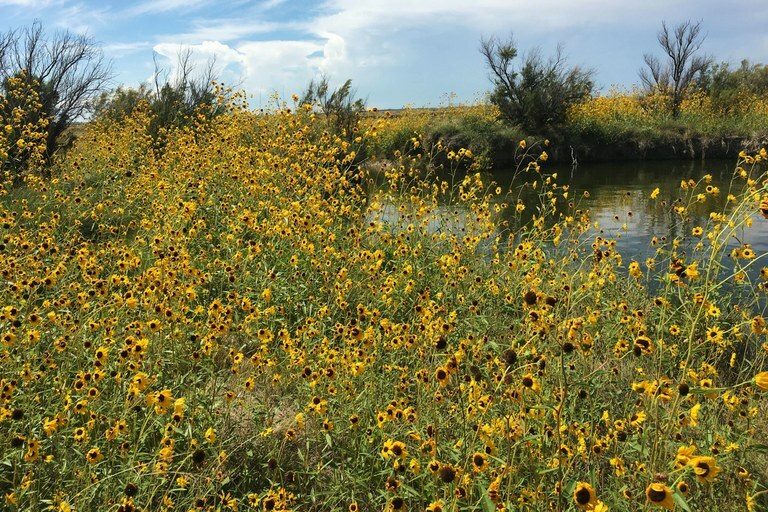 Stands of Pecos can be just as large and dense (thousands of individuals) as summer-blooming common sunflowers, but they bloom later, in September and October. We were mapping the flower’s prevalence at La Joya Wildfowl Management Area, where one of only seven distinct populations of it is currently known to exist. GPS units in hand, we marched along margins of invasive saltcedar and Russian olive, through fields of wetland grasses and common sunflowers, in search of stands with the narrower, thicker, brighter green leaves of these late-bloomers. But why? What was it all good for? In the midst of all this circling, thoughts began to circle in my mind, in a loose but urgent orbit around this rare, desert wetland-loving sunflower. Helianthus paradoxus — puzzle or “paradox” sunflower, as Pecos sunflower is also commonly called, perhaps owing to its insistence on finding wet soils in otherwise arid environments. If the water dries up, Pecos sunflower disappears. I arrived in New Mexico to start this job in the middle of July amid talk of the second-lowest snowpack on record. The Rio Grande dirt-dry, in some sections as early as March. All national forest land in the north closed by the threat of wildfire. The whole state of New Mexico in varying degrees of historic drought. A climate future that will deepen these extremes, mercilessly. Wetlands and spring seeps, or ciénegas, the type of habitat in which all known Pecos sunflower populations live and die today, were once comparatively widespread in the Southwest. Most have been severely degraded or dried up entirely in the past few hundred years. The same old story of confused over-utilization — the draining of wetlands and extensive pumping of groundwater for agricultural and city use, overgrazing and its associated erosion, encroachment by introduced invasive species — made a dry land even drier. How much of what is frightening and uncertain about the ongoing environmental history of this region can be encircled in the bright yellow of these rare blooms? After six months working as a crewmember on a conservation corps throughout Arizona, and three months monitoring vegetation for restoration projects along the Rio Grande, I feel a great dizziness that arises along with the sense that I am, waveringly, coming into my own in this dry and drying land, so far from most of my childhood — now, in this age of extinction. I don’t know what the future holds for me, or for the Pecos sunflower, or for the many other creatures, human and otherwise, living in the Southwest and beyond. I do know that as I write these words in late September, not far away, fields of Pecos sunflower are blooming bright yellow, unconcerned and alive — sunny, oblivious medallions of life. Sawyer Hitchcock grew up in suburban Indiana and graduated from Ithaca College in New York with a degree in English in 2016. He intends to pursue environmental studies/humanities at the graduate level in the next year or two. The Bell Prize for young essayists honors the spirit of our founder, Tom Bell. At a time when there was little coverage of environmental issues in the American West, Bell founded HCN in 1970 and was a strong voice for conservation. The Bell Prize is awarded to emerging writers, aged 18 to 25, who can carry on that legacy. Read the winning essay.